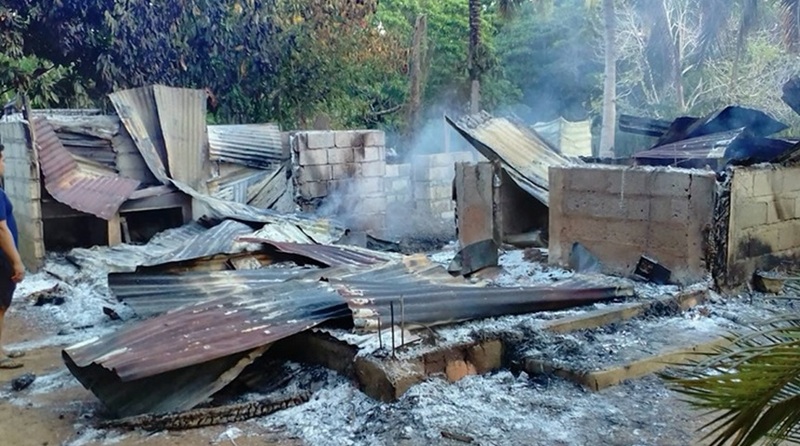 A man allegedly burned his own house down after he figured in a heated argument with his wife and ran amok in Dagohoy town on Sunday evening. According to fire investigator SFO1 Mesael Galan, Eutiquio Ampo Sr., 55, and his wife Luisa, 53, argued about debt problems in front of their son, 21, and daughter, 27, before the house was razed to the ground at past 11 p.m.
Eutiquio who is now suspected of arson remains at large, authorities said. He allegedly set fire to the house after driving away Luisa and son Joshua, a seaman, by chasing them with a knife. Meanwhile, the suspect’s daughter Jesuah was hiding when he allegedly burned down the house. She told authorities that Eutiquio gathered withered coconut leaves and lighted these up to start the blaze. Jesuah said that she stayed hidden and was unable to restrain her father out of fear. Initial investigation also indicated that Eutiquio was under the influence of alcohol during the incident. However, none of the Ampos were injured while the fire did not spread to other structures as it was located in a secluded area. According to Galan, the fire left P400,000 in property damages. The family’s new motorcycle worth P100,000, gadgets including a laptop, cash and several sacks of grains and rice were burned by the fire. Galan said that firefighters were no longer able to respond to the incident as the house was already burned down when they were alerted.